Paul Cook admits he can’t put his finger on the reason for Wigan Athletic’s struggles on the road as they prepare to visit Millwall tonight. 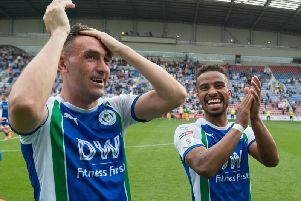 Latics have lost their last four away games, and six out of seven in the Championship, last winning on their travels against Stoke in August. But the manager, taking his team to The Den on the back of an impressive 1-0 win over West Brom last weekend, insists results only tell part of the story. “It is what it is, what do we put the away form down to? We don’t know,” he said. “We prepare as well as we can, we do the right things, the lads turn up and unfortunately for us we do feel QPR, Norwich, Aston Villa, they’ve all been losses, have we really deserved to lose at those places? Not for me. That can happen. It’s margins. People always speak about it now and managers do regularly. The margins are very small. Although 22nd in the Championship, and aiming to make amends for a 3-1 loss to Reading last weekend, Neil Harris’ Millwall have troubled some of the division’s big sides at home this term, boasting a win over Aston Villa and a draw with Leeds. Cook is expecting a difficult task tonight despite Millwall’s league position, and the Latics boss has backed them to recapture the form of last season which saw them finish eighth in the Championship. “To go to Millwall at any given time, it’s never ever easy. It doesn’t matter where Millwall are in the league, what run they’re on, whatever,” he said. “To win at The Den is a very, very tough place. Millwall’s home record this year is fantastic. Neil and his staff will be trying their best to get the lads beck into the mould that had them where they were last year. They will do that for sure. It’s a very unforgiving place. “It’s not easy for me to speak about clubs, especially when you don’t have first hand experience of playing them. Cook also believes last week’s result didn’t reflect how Millwall played against Reading. football and that’s what it brings.